About a year ago, one of the finest humans I've ever met died after a horrific fight with pancreatic cancer. I'd known Susan Carr a scant two years by then, but she was one of those people who rocket straight to the top of your "besties" list if you're lucky enough to come across them in the wild. Susan was my client first, my editor later, a friend sooner than I deserved, and an inspiration throughout. I looked forward to every single exchange with her—too few of them happened in person, but she could make a phone call count. She was that rare combination of smart, talented, principled, and compassionate, and dammit if she didn't have a wicked sense of humor on top of it all. Aside from her amazing work as the educational director of ASMP and her professional work as a photographer, Susan was also an amazing fine-art photographer. Her final project, a series of interiors of homes across the U.S. that had been continuously inhabited by their occupants for 40 or more years, is rich with quiet insight. 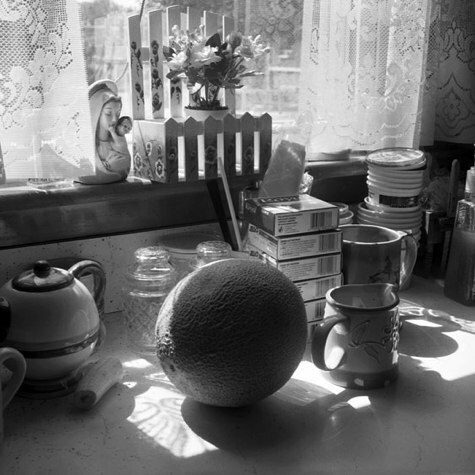 Each black-and-white photograph tells a story without saying a word, partly because when we spend enough time in one place, we wear little grooves into it with objects and arrangements that reveal our hopes, dreams, and values, but also because Susan had an unerring eye for capturing those spaces—honestly, respectfully, and humbly. Susan spent her last days editing the collection of images. It was her dream that someday, they be assembled into a book. Some good friends and colleagues have picked up where Susan left off and prepped this beautiful, 140-pp, hardcover book for production. The $42 price tag isn't cheap, but it's good for a high-quality art photography book, and includes shipping (to the lower 48, I'm guessing). And all the money goes toward production; services are donated. We're hoping to get pre-orders for a minimum run of 1,000 copies by September 24th. If we don't meet our minimum, no book; if we surpass it, the individual book price will go down. I like to think that if she'd lived longer, Susan Carr would eventually have taken a photo of my crazy little pink-and-dingbat-tiled kitchen. After all, I've lived here for 14 years already; it's not impossible that a 78-year-old me could still live here, and a 77-year-old Susan trundle up the stairs with whatever cameras would look like by then, to snap a few shots. Maybe she would have captured the quirks of my personality in the odd objects I keep in my pen cabinets. Maybe she would have found the thread in the collection of notes on my fridge, or some personal-yet-universal truth in the thrift-store lamp with the ruined shade I never did get around to replacing. Maybe she would be able to tell my story in a way I cannot, because I am too close to it, or because I still have too many magazine-fueled ideas of how things are supposed to look. She was adept at telling stories, Susan Carr. Partly because she was gifted, but also because she was wise: she knew what was good, and that most of what we have in our brief time here is more than good enough.